HTC's new flagship phone is an absolute monster. Quad-core 1.5GHz Tegra 3 processor, 4.7" 720p Super LCD2, 8MP f2.0 camera with its own image processor. I got to spend a little time with this thing, and it's the most excited I've been about a phone in a long time. HTC has been listening to feedback and taking notes lately. People were confused with the gagillion phones they launched in the last couple of years, so they recently announced they're paring back. Today, we're seeing what that means. HTC is introducing the "One" series. It's basically what the "Galaxy" series is to Samsung. 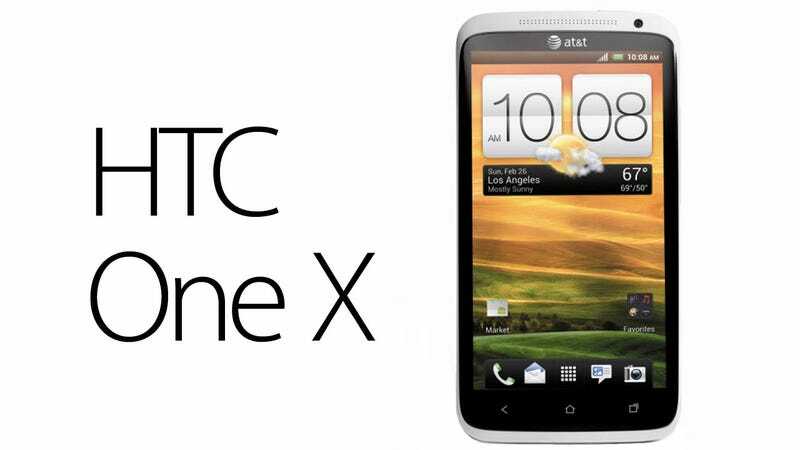 The One X is the series' flagship, and from the limitad amount of time I got to spend with it, I was very impressed. Let's start with what's on the outside. The 720p 4.7-inch Super LCD2 is among the most beautiful I've ever seen. Colors were vibrant and bright and it looked almost matte, like a high-tech magazine. Viewing angles were unbelievable and it worked well in bright sunlight. At 312ppi (pixels per inch) it isn't quite as jam-packed as the iPhone 4S's 330ppi or the HTC Rezound's 342ppi, but it's gore-juss. The body is made out of a machined polycarbonate which makes it light, but it feels very strong and rigid. The back of it has a sweet curve that makes it feel really good in your hand, but it still sits flat on a table top with no wobble. This is due to the little camera hump. And speaking of the camera, HTC is going for broke here. The rear camera is 8PM and has "the best optics and sensor (they've) ever used", which remains to be seen, of course. But it does go all the way down to f2.0, which means it should rule in low light. I don't think we've seen a camera go that low on a mobile device yet. It also has HTC's new ImageChip, which is basically a secondary processor used exclusively for the camera's image processing. It will enable you to be shooting 1080p video and take full resolutions stills at the same time. Impressive. Moving to the insides, the phone's banner feature is the quad-core Nvidia Tegra 3 processor, clocked to 1.5GHz. I only got to play with it for a few minutes, but it seemed to absolutely fly. It tore through the UI and launched applications super-fast. Handled multi-tasking well and applications ran smoothly. Obviously, much more testing will be required, but the Tegra 3 is the same guts that powers the Transformer Prime tablet, and if it performs similarly, things will be looking good. UPDATE: I got some bad info from HTC. While the international version will use the Tegra 3, the U.S. version (on AT&T) will be using Qualcomm's new S4 processor. Specifically, the Snapdragon S4 MSM 8960 processor. That processor is a beast in its own right, but it's dual-core, not quad-core, which may disappoint some gamers. Or maybe it'll be just as good. The HTC One S I played with used the S4, and it didn't seem any slower than the Tegra 3 version of the One X. Time and testing will tell. The phone has Beats by Dre audio built into it. You might remember that Beats was kind of a non-starter in the HTC Rezound because it could only be utilized in the proprietary player, which was dumb. HTC learned from this mistake and they've pushed the API waaay down deeper. You can now have the Beats enhancements on any audio or video you play through the phone. That includes Spotify, Google Music, YouTube, anything. The One X has 1GB of RAM and 32GB of storage, but you get 25GB of free Dropbox storage for two years when you buy the phone (that's an additional 25 to what you already have). It has an NFC chip to support Google Wallet and other features, a front-facing 1.3MP camera (capable of 720p video chat), and a 1800mAh battery. Oh, and 4G LTE radios. On the software side of things, it will ship running Android 4.0 Ice Cream Sandwich with HTC's Sense 4.0 UI. I have gone on record as hating Sense, so I was shocked when I actually didn't mind Sense 4.0 at first glance. In fact, in some cases it looks better than Ice Cream Sandwich. The multi-tasking interface is designed more intelligently, using full-screen cards that are much easier to sort. Here, too, HTC has be listening and changing. Their rep told me that they were hearing that a lot of people found Sense to be too heavy, and so they've pared it way back. Ice Cream Sandwich looks really good and is very intuitive, so they've let it do the heavy lifting and just augment it here and there. This is exactly the right approach. Obviously, I'll need to spend much more time with it, but not hating it at first sight is a good sign. There is also a very robust camera suite with HDR modes, burst modes, and all sorts of tweaks and effects. They are also coming out with an accessory that sounds awesome (though I didn't get to see it in action). The HTC MediaLink is an HDMI dongle that pops right into your TV. It should allow for perfect screen-mirroring. In other words, if you want to watch a movie or play a game, you'll be able to play it off of your phone, onto your TV in full 1080p with high-quality audio. I actually really like playing games on my TV using my phone or tablet (I've been doing it with the Transformer Prime), but microHDMI cables pop out way too easily, and you have to be way too damn close. This will hopefully solve that. There will also be a car dock. We don't have an exact release date, but we were told it will be out within the next 60 days. It will be coming to AT&T exclusively in the U.S. and will be available in white or black. No word on pricing yet, but $200-$300 is probably a safe bet. We'll be testing and giving you a full-review as soon as possible. I don't want to get my (or your) hopes up, but my first impression: this is what I wanted the Galaxy Nexus to be. It's a really exciting piece of hardware.